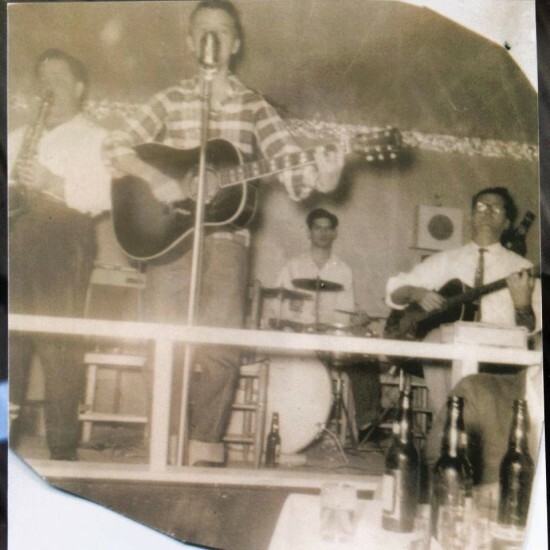 When rock and roll was breaking out like wildfire six decades ago, causing the older generation conniption fits as it enticed youthful gyrations all around the world, Joe Clay was a dedicated and highly enthusiastic disciple, a teenage rockabilly wildman whose stage act achieved unbounded energy levels. Happily, Joe brings that volcanic intensity to his blistering sets to this day. He ignited several previous Ponderosa Stomps with his athletic showmanship, and he’s ready to set the Rock ‘N’ Bowl ablaze this time around too. Born with the mellifluous handle of Claiborne Joseph Cheramie on Sept. 9, 1938, in Harvey, La. (10 minutes outside of New Orleans, just across the river), Clay started young on his musical odyssey. “When I was 12 years old, my mom and dad on Sundays would go to this country and western place, and they took me,” says Clay. “I’d watch that band all the time, but I’d watch the drummer. I kind of liked that drummer. There was something about drumming. So I told my dad one Sunday, I said, ‘I can play them drums!’ He said, ‘What?’ I said, ‘Gee, I think I can.’ So he went and asked the guy, could I sit in? And the dude says, ‘Yeah, come on!’ And I played, and I freaked ‘em all out ‘cause I played drums! And that’s how it started. The lad’s rising reputation was sufficient to get him on the fabled “Louisiana Hayride” up in Shreveport on Aug. 27, 1955. C.J. 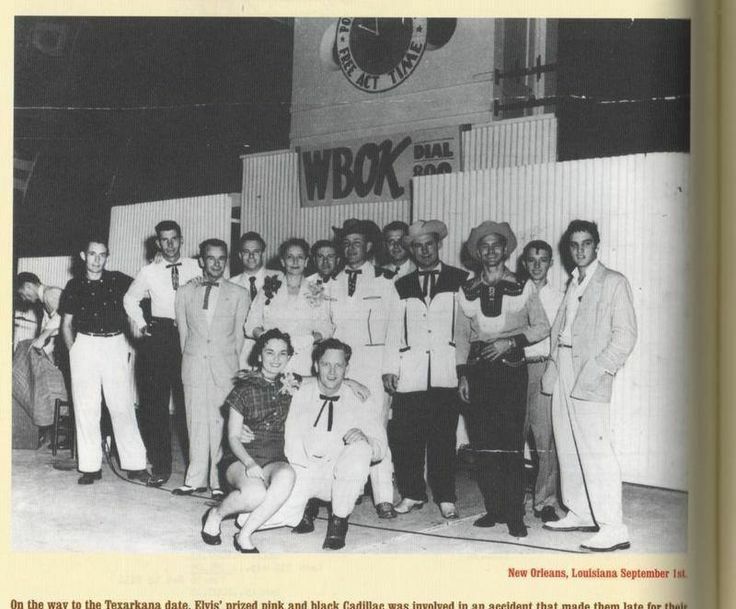 Cheramie shared the all-star bill, broadcast over WBOK-AM, with Jim Reeves, Lawton Williams, Jimmy Swan, Ernie Chaffin, Luke McDaniel, and a fast up-and-coming Sun Records star, Elvis Presley. “Oh, that was cool, man!” exclaims Joe. Four days later, Elvis found himself without drummer D.J. Fontana for a gig at Pontchartrain Beach Amusement Park. Elvis Presley, right, standing next to Joe Clay during a Louisiana appearance in the mid-’50s. “His drummer was sick, couldn’t make it,” he says. “So I had just performed, and I was getting ready to leave, and he says, ‘Hey, Joe, can you play my set for me? Because the drummer couldn’t come.’ I said, ‘Sure, I can play it!’ ‘You know my stuff?’ ‘Yeah, I know it all! It ain’t no problem.’ Even if I didn’t know it, I could feel it. So that was it. That’s the first time in my life that I got paid twice. I got paid for me, and then he paid me. “He was a regular dude,” adds Clay of Presley. “A beautiful guy. It was amazing. A few years later, I saw him at the Municipal Auditorium. He’d done a concert. And he was completely different. There was something about him that wasn’t right. I said, ‘My God, what happened?’” Joe also shared a bill with Carl Perkins at Pontchartrain Beach. Although RCA Victor had recently signed Presley as its flagship rocker, the mammoth label was on the lookout for more young artists of a similar bent in early 1956. WWEZ deejay Charlie “Jolly Cholly” Stokely, who booked talent at several nightclubs in the New Orleans area in addition to his daily on-air duties, fielded an inquiry from the company. “He was the disc jockey at the station that got me to make that tape,” says Joe. “That’s how that started. Diaz accompanied his new recruit to Bill Quinn’s Gold Star Studios in Houston on April 25, 1956. One of Herman’s first brainstorms was to invent a new stage name for his discovery, apparently deeming C.J. Cheramie too difficult for non-Louisiana natives to wrap their tongues around. “Duck Tail” had just been written and waxed on Starday by Texas rockabilly Rudy “Tutti” Grayzell, while “Sixteen Chicks” was the work of veteran Lone Star performer Link Davis, who happened to be on rhythm guitar for Joe’s version. Davis was past 40 by then; his Starday version of “Sixteen Chicks” swung handily, but it didn’t spew the molten fire of Clay’s cover. While Harris unleashed some savage guitar solos (he appeared on plenty of Starday rockabilly sessions and cut a handful of gems as a leader for the label, notably “Jitterbug Baby” and “I Don’t Know When”), Clay was less than knocked out by the trapsman he inherited that day. 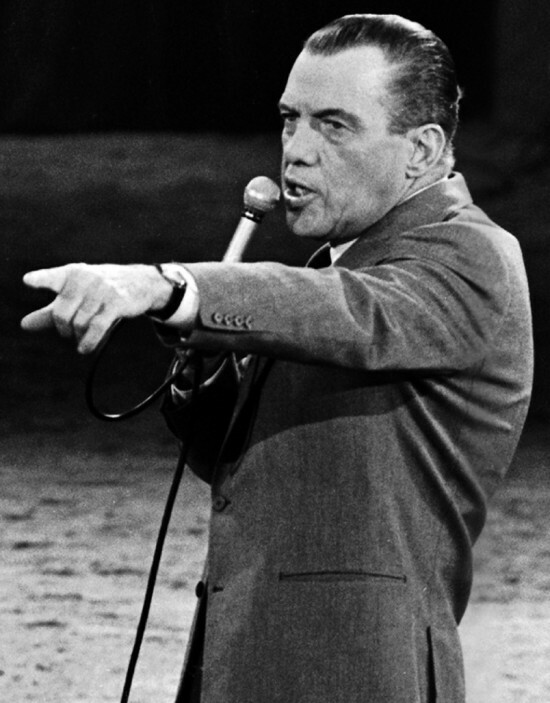 Clay came to New York that May to appear on stone-faced Ed Sullivan’s top-rated variety program on CBS-TV, headlined that particular Sunday evening by Cole. Things didn’t quite go as planned for the newcomer. 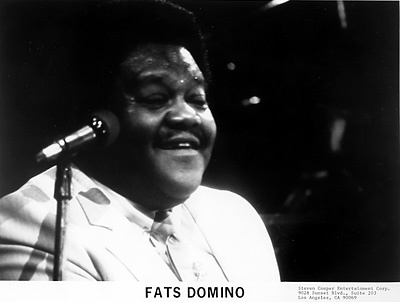 While Joe was in New York, Diaz brought him into RCA’s Studio 1 on May 24 to cut another session, a scant month after the one in Houston. When he arrived, Clay was astonished to see an all-black band assembled for the occasion. “That kind of freaked me out, ‘cause of being from where I’m at,” he says. “I said, ‘That’s kind of crazy, man!’ But boy, was it good! It was so strong when we were recording. RCA’s got like seven studios right next to one another. And once we started playing, everybody came to see what all this excitement’s about. 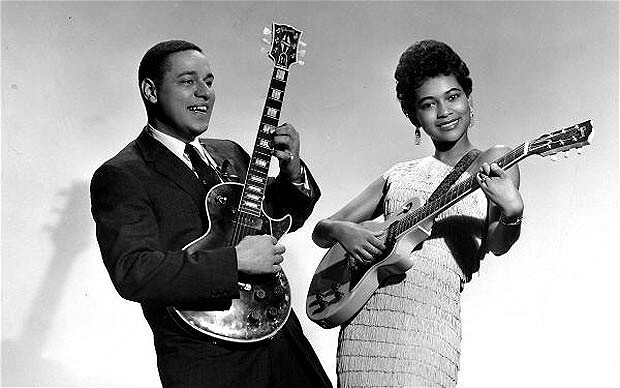 On lead guitar was Mickey Baker, busiest axeman on the New York R&B studio scene (“Love Is Strange,” the lovey-dovey duet he waxed with singing partner Sylvia Vanderpool, would top the R&B charts in early 1957 on RCA’s Groove subsidiary). “He just sat down on his amp and just played, man,” says Clay. “Wow!” Skeeter Best held down the other guitar chair. Leonard Gaskin was on bass. Diaz really beefed up the backbeat by hiring two ace drummers, Bobby Donaldson and Joe Marshall, and having them play in tandem — a virtually unheard of strategy. “That’s what made it so crazy, man!” says Joe. “I mean, the energy was totally unbelievable.” Despite the band’s shared R&B heritage, the results were pure rock and roll. Herman handed Clay two numbers of the R&B persuasion that were twinned as his Vik encore, though you’d never know their origins from the rockabilly racket the studio combo cooked up. Atlanta-born blues shouter Titus Turner had cut his jumping composition “Get On The Right Track” four months earlier for Mercury’s Wing subsidiary, though it’s probably best known through Ray Charles’ late ‘56 rendition for Atlantic. Joe tore into it with a vengeance, Baker’s slashing riffs shadowing him every step of the way. 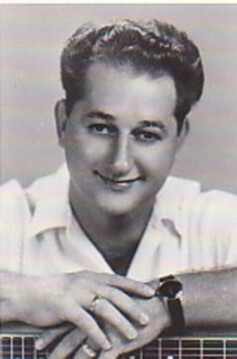 Penned by future Mercury A&R boss Clyde Otis and eventual Musicor Records founder Aaron Schroeder (under the alias of Doc Rockingham), the vicious grinder “Cracker Jack” was technically Joe’s property first; the Cues, New York’s top R&B backing vocal group, waxed a faster version for Capitol five days later. Baker’s mind-boggling 12-bar solo struck like a laser beam aimed right between the eyes, and Clay was every bit as fiery vocally. Once again, Vik never bothered to release a pair of stormers that were just as stunning as the two it did issue. “Did You Mean Jelly Bean (What You Said Cabbage Head)” was a catchy rocker with a nonsensical Bill Haley-style chorus that could have pulled some coin, but it was the fire-breathing “You Look That Good To Me,” another Otis copyright (this time in cahoots with bespectacled piano-tinkling R&B hitmaker Ivory Joe Hunter), that really shook the studio walls. Baker was never more crazed, and Joe sounded like he was losing his mind on the mic. Clay screamed, “Get hot or go home now!” midway through Mickey’s solo on take four; the whole chaotic thing barely broke the minute-and-a-half mark in length. Placing his Joe Clay identity in mothballs, C.J. Cheramie made his mark on Bourbon Street, his trio settling in at the 544 Club for five years. “I had a guitar player that lived in town, and I had an organ player, and he played the B-3,” says Clay. “He played the bass with his feet. So it was the three of us. And I done the drums and sang.” He crossed paths with Mac Rebennack, Frankie Ford, even Smiley Lewis during this period. “He was very quiet,” he says of Smiley, who was anything but that onstage. Bonvillain co-wrote both sides of the first Russ Wayne 45 on Samter, pairing “Can’t Get You Out Of My Mind” and “Don’t Know What To Do,” which hit local shelves in the summer of 1962. Recording for Samter at Cosimo Matassa’s fabled studio in the French Quarter, Clay didn’t allow the idiomatic shift to swamp pop to faze him in the slightest (having Rebennack on piano didn’t hurt its pungent bayou atmosphere one bit). With no deejay support, the C.J. Cheramie Trio would be limited to personal appearances only after that. 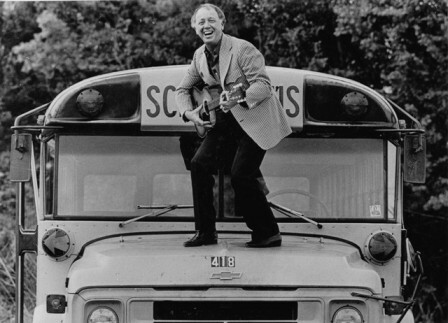 In 1971, Joe began driving a school bus in Gretna, a gig he held onto for the next three decades. But he’s quick to point out he was “still playing every night. I never quit music. The resurrection of Joe Clay was under way. Before long he found himself in England, ready to embark on a new and entirely unexpected chapter of his musical career. “When he was getting ready to bring me onstage, they turned all the lights out,” says Joe. “And when he introduced me and I jumped onstage, they had a big light that hit me. And when it did, all the fans in the front were just falling over, passing out like! I said, ‘Oh, my God! What’s going on?’ And what had happened, they thought I was dead! And when they seen me, it was just I guess too much to bear. They went, ‘Wow, it is him! He’s alive!’ I’ll never forget that, man. Joe has been a regular overseas visitor ever since, tearing up stages wherever he roams. In 2004, he cut a fresh album, “The Legend Is Now,” for the Spanish El Toro label. He’s got a Japanese tour lined up for later this year. Naturally, Clay looks forward to scorching the Stomp stage on Oct. 2. “Even today, I sit down, and when I’m by myself I start thinking and saying, ‘Man, what is happening here?’” he exclaims. “I just got back from Italy. That was unbelievable. It was insane. “Next year is going to be the biggest year I ever had for Joe Clay. Usually I’ve got at the most two or three jobs overseas a year. That’s the most. Next year I’m going to have about ten. I’m going to Australia. I’m going to Holland. I’m going to Germany. I’m going to England. I’m going to France. 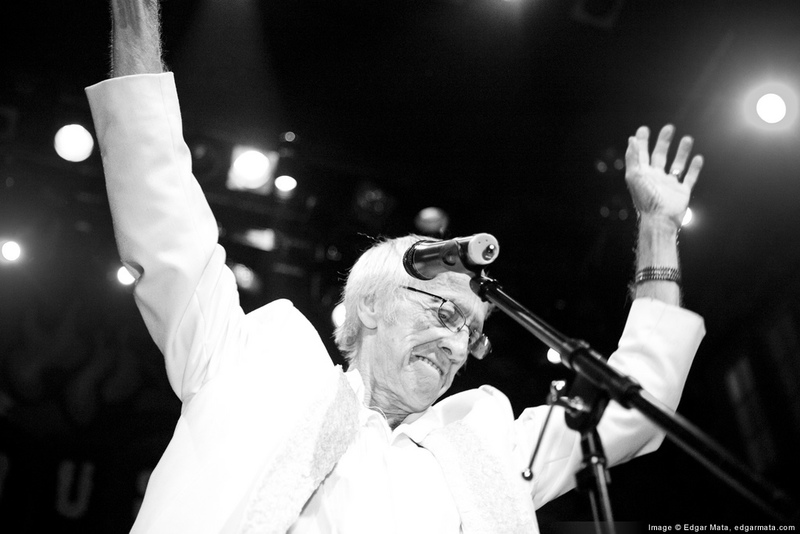 See the inimitable Joe Clay at the 2015 Ponderosa Stomp late Friday night, Oct. 2.